These two do it all over again in Bayern's Allianz Arena on 16 March. A goalless draw will be enough to send Bayern through. Juve have to score in Germany. Bayern enjoyed two-thirds possession away to the best team in Italy but still couldn't win. Bayern's players have gone over to applaud their travelling fans. There isn't a smile to be seen on any faces wearing red shirts. As for holding hands and performing running dives in front of them...forget it. Terrific tie. Helter-skelter at times. Bayern will head back to Germany feeling a little flat after being in such a commanding position. 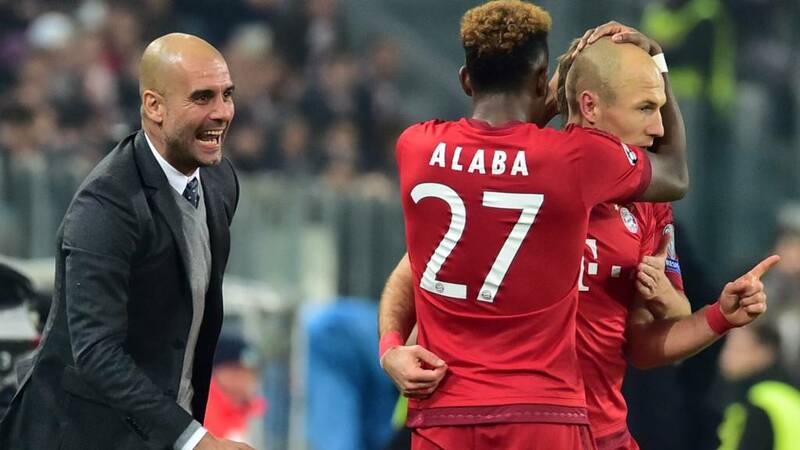 Great fightback by Juventus but have they got the ammunition to bring down Pep Guardiola's men in the second leg? Pinball inside the Juventus area before Juve just about get it away. Three minutes of additional time. Time for a late twist in a tie oozing drama? Martin Atkinson has had a pretty good game but he is forced to brandish another yellow in Arturo Vidal's direction after the former Juventus man after almost ripping the shirt from Alvaro Morata's back. Bayern are finishing strongly. Franck Ribery gets beyond his man before pinging the ball across the six yard area. Juventus escape. Just. Four minutes of normal time remaining. Arjen Robben skips past a challenge before cutting in and squaring across the six yard area. A Juventus leg just about manages to stab it clear. Barcelona have increased their lead away at Arsenal, Lionel Messi's second goal making it 2-0 to the Champions League holders. Follow that game on the BBC Sport website. No one is leaving their seat inside the Juventus Stadium. This tie has ebbed and flowed and there is still time for another late twist before the second leg in Munich in three weeks. Juventus are doing all the pressing in the closing stages. The visitors can't clear the ball inside their area and Paul Pogba heads just over. The home fans are in full voice. Bayern, with their two away goals, will still be favourites to advance if the score remains like this. But what a comeback by Juve. They looked down and out when Arjen Robben made it 2-0 but two goals in 13 minutes has turned the tie upside down. Can Juve get another? Astonishing scenes in the Juventus Stadium. Substitute Stefano Sturaro stabs home an equaliser which seemed so unlikely 15 minutes ago after Alvaro Morata - another substitute - heads across goal. Bayern are on the ropes. News from the Emirates where Arsenal are trailing Barcelona 1-0, Lionel Messi with the goal for the Spanish side. You can follow that match here. Juventus' second change as midfielder Sami Khedira comes off for Stefano Sturaro. What an astonishing turnaround. Bayern Munich were bossing this so much it was starting to get embarrassing for Juventus but Dybala's goal has turned the tie on its head. On the counter, Manuel Neuer produces a huge save to keep out Juan Cuadrado before Paul Pogna curls an effort just over. Juve fans, silent for long periods, are roaring their team forward. Tempera are bubbling and Martin Atkinson has his work cut out as Mario Mandzukic and Robert Lewandowski go head-to-head. Atkinson issues a stern lecture and nothing more.